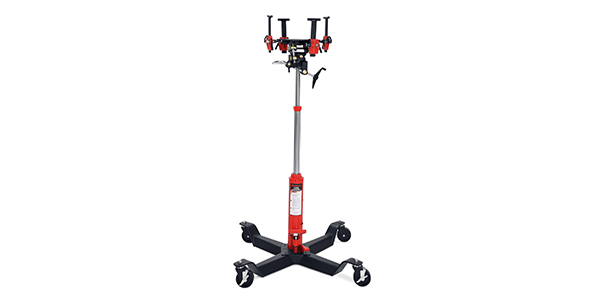 Engineered with ease of use in mind, the Snap-on 1/2 ton Telescopic Hydraulic (TJ100) and Air/Hydraulic (TJA100) Transmission Jacks feature saddles with multi-position, adjustable ratcheting arms to fit any configuration of FWD, RWD and 4-wheel drive transfer cases. 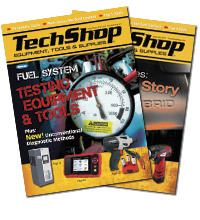 Both tools are fully assembled and tested in the U.S. The TJ100 has a manual, two-stage lifting operation using hands-free foot pedals, while the TJA100 couples an air-assisted, dual hydraulic ram first-stage lifting operation with a manually-operated second stage via hand crank. With a 75 in. maximum height for unparalleled access and a 35 in. minimum height for easier transmission movement from the jack to the worktable, both transmission jacks offer a wide range of motion and utilize ball-bearing thrust washers on the saddle tilt adjusters for ease of turning. The heavy-duty 36 in. bases also feature four five-inch polyurethane swivel casters, two in locking style, for easy maneuverability. In addition, the jacks are equipped with special, high-performance hydraulic oil for extreme temperatures and reduced wear, premium seals on pumps and ram pistons for a longer tool life and a cam buckle tie-down strap to secure the load. Each is compliant with the most recent safety standards put forth for ASME-PASE 2014.